Dorm lights are one of those dorm necessities you can't go to college without. They'll add more dorm lighting to your college dorm room, which is essential. After all, that overhead dorm light won't put out much light to study by and it won't add much to your dorm room decor. However, dorm Christmas lights can do both of those things! You'll get extra light in your college dorm room and you'll also get some cool looking dorm room decor. For versatile dorm lighting in your college dorm room, add our 18' Red Rope Light! 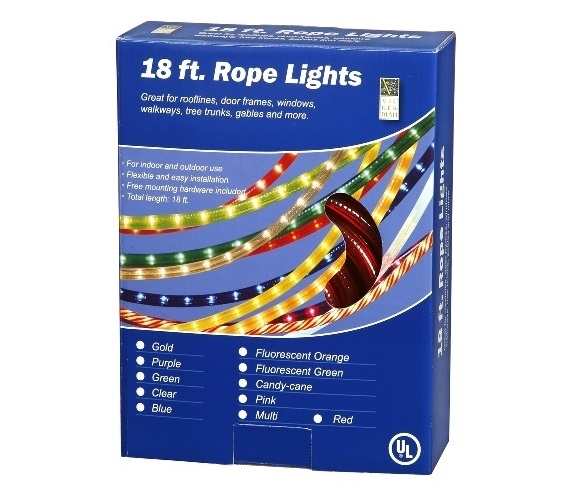 Our 18' Red Rope Light is a versatile dorm essentials item that can be used year round for your dorm room decorations. During the holiday season, you can wrap these dorm necessities around your college Christmas tree and during the rest of the college year, you can have these dorm essentials wrapped around the perimeter of your college dorm room. You can even get creative and make a design on your college dorm walls for some extra dorm wall art! Featuring bulbs with one inch spacing, you'll get plenty of dorm lighting for both your college dorm room and for your dorm Christmas tree.